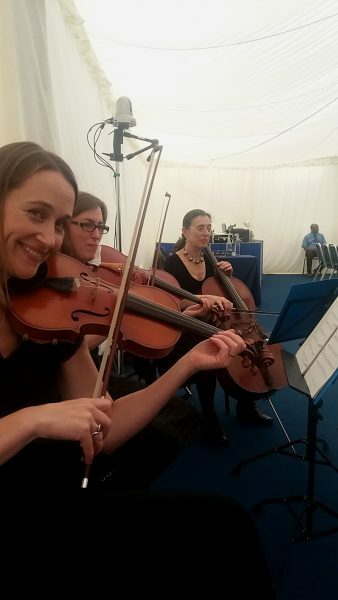 Oxfordshire String Quartet for Graduation Ceremonies – On Friday 26th September¬†our string quartet had the pleasure of accompanying two awards ceremonies held at the Henley Business School, located on the University of Reading‚Äôs Greenlands Campus. A huge marquee had been erected for this purpose and our role was to supply graduation ceremony music as everyone was being seated prior to the ceremonies commencing, as well as at pivotal moments during the awards themselves. We chose a selection of classical pieces to precede each of the ceremonies and these included Debussy‚Äôs ‚ÄòReverie‚Äô and Boccherini‚Äôs celebrated ‚ÄòMinuet‚Äô. At the start of the ceremony, members of staff and chief officers processed into the marquee, and for this we played Handel‚Äôs ‚ÄòHornpipe‚Äô (perfectly encapsulating the optimistic yet formal atmosphere of an awards ceremony). Then, as each group of graduands stood up and walked to their place in the queue for awards, we played various parts from Boyce‚Äôs Symphony No. 4, a work borrowing heavily from Handel‚Äôs style and again fitting the procession of students perfectly. Although graduation ceremonies only involve occasional uses of music, it is a situation where alertness is required throughout. It‚Äôs also very rewarding to contribute to such a significant day in many people‚Äôs lives, where such hard work is rewarded in such a fitting way.